To mitigate cancer risks, women seek natural options. Sometimes the cure can seem worse than the disease. Where it comes to mammograms and other cancer diagnostics, radiation might be a risk. A relatively new type of breast cancer screening test is called Molecular Breast Imaging, or MBI. It involves injecting a radioactive trace into a vein in the arm. A scanning device follows the trace to detect when a tumor is present. But really? Do women (and men) at risk of cancer of any kind want to inject something radioactive in their body, albeit at a very low level? The MBI process received FDA clearance for use back in 2003. The facts are that mammograms, the most common type of breast cancer diagnostic, involve radiation as well. A patient who believes they bear a reasonable risk for cancer – for example, with a family history of the disease – or who has been told by a doctor they need to get a mammogram, should follow doctor’s orders on getting the test. But many patients worry about invasive measures, particularly if they present no symptoms of disease. Better that a self-exam or a non-invasive procedure be followed. 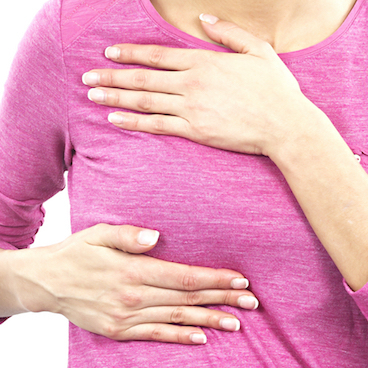 There are such non-invasive, natural breast screening methods. One might consider ultrasound as natural, as it is non-invasive. Sound waves might be considered akin to standing near a loudspeaker or freight train (the ultrasound is of no risk to your hearing). 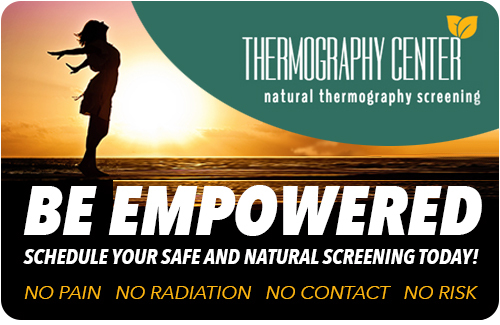 Another non-invasive procedure is thermography. Approved by the FDA in 1982, it’s considered an adjunctive diagnostic procedure for detecting breast cancer (meaning it should be used as a supplement to other methods). It operates something like a thermometer of breast tissue, identifying where warm spots exist that might be due to angiogenesis, the biological process of tumor development that generates heat in surrounding tissue. Thermography (medical infrared imaging) procedures require the patient to basically achieve a sedentary (no activity) temperature from 15 minutes in a sun-free, temperature and humidity controlled room (unclothed to reach a temperature equilibrium). The skin surface nearest a tumor will provide evidence of heat that is then measured. A 1996 study (Guido and Schnitt) concluded that angiogenesis by infrared imaging could be found in 86% of non-palpable breast cancers. There are other alternatives to mammogram and MBIs: ultrasound, breast tamosynthesis (3-D mammography), and magnetic resonance imaging (MRIs). But they either involve radiation or imaging tracer injections. For women with average or small size breasts the amount of radiation used to examine the breasts is less than what is required of women with large breasts, dense breast tissue or those who have breast implants. Other individuals who might be wary of radiation exposure include younger women (premenopausal) who will consequently have more examinations over their lifetimes. Also, survivors of Hodgkin lymphoma at a young age who received radiation to the chest area are at greater risk; they have a 3-7 times greater risk of breast cancer than Hodgkin lymphoma survivors who were not treated with radiation (Hodgson, Gilbert, Dores, et al. “Long-term solid cancer risk among 5-year survivors of Hodgkin’s lymphoma,” Journal of Clinical Oncology 2007). Clearly, informed patients need to consider their options – and find comfort in that several exist.